Blurb from Goodreads: Despite the tumor-shrinking medical miracle that has bought her a few years, Hazel has never been anything but terminal, her final chapter inscribed upon diagnosis. But when a gorgeous plot twist named Augustus Waters suddenly appears at Cancer Kid Support Group, Hazel’s story is about to be completely rewritten. Why Read: After refusing to read this book for over 5 months, I sat down to find out what was so special about this book that everyone I know was raving about. I am not the largest of fans when it comes to romance novels, especially when the two lovers are under the age of 25. But I found myself feeling teary-eyed at the ending of The Fault in Our Stars (No Spoilers though promise). I mean, in finishing the book, I was sad to let the characters retreat to the page of the novel. Review: I have so many words about this book. The first being – I’m sorry for doubting you, John Green. John Green outdid himself, and it’s hard to imagine a more realistic book when it comes to cancer, disease and death. I understand many of the emotions that run through the veins of the story, given a family history of cancer- and the way that John Green wrote, I felt as though he understood every word. Hazel Grace, Isaac, and Augustus are all characters I empathize with, and truly feel as though I can connect to how they are feeling and why. The ages of 17 gave my initial impression of the book a lower score, as I’m normally not in the business of reading teen novels- but I think there wasn’t a better time for the story in The Fault In Out Stars to be set, because it gives the background a sort of edgy growing up characteristic tempered by the hovering cloud of death that follows the characters like a stalker. Augustus and Hazel Grace’s relationship was the cornerstone of the story for me. John Green must have made sure that of all the terrible and unfair things that happen in the book – love triumphed. So I place the cancer-ridden character of Hazel Grace and the stubbornly normal Augustus as people of importance. How can two characters of a young age be such studies into what always happens when the word ‘terminal’ comes into play? I don’t know… but the relatable-ness is unmistakeable. Anyone could be Augustus and Hazel Grace. Plotwise: Gosh, I can barely think of it without crying at the unfairness of it all. But maybe that’s what makes The Fault In Our Stars so special. It recognizes multiple times throughout the novel that life isn’t fair. And the only way to handle it is to carry on. There’s no way to ignore it or combat it, but instead focusing on what’s good in life – a picnic or playing a game. It’s the small things that count. 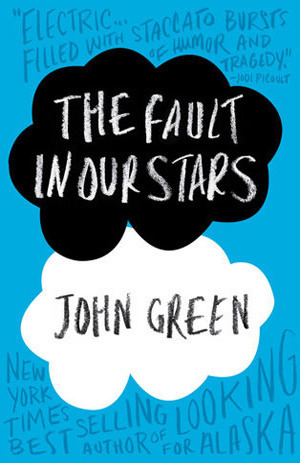 There is not doubt in my mind as I give The Fault In Our Stars, 5 Stars. It felt with the book, my heart ached and the characters were as real as anyone I knew. So yes. I’m giving in to the popular view – this book was amazing, absolutely incredible, and anyone who wants a good book to comfort them, or to not will find a place to hold in its pages.